I have signed up for an encaustic workshop with my husband and I am so excited about it that I couldn't wait. It's being taught by Chicago artist Bridgette Guerzon Mills and you can check out her amazing blog Contemplating the Moon, here. 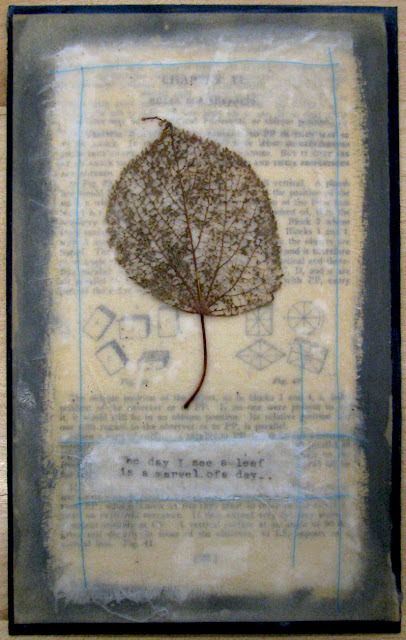 So this is my second attempt at a mixed media encaustic. I'm still experimenting with the whole process, figuring out how to fuse the layers just right and how to work with the transparency of the materials. I knew they would become translucent I just had no idea how much! I began by painting a blackish border onto a piece of illustration board and then I fused a page torn from an old art book to it with wax. I have absolutely no idea what kind of wax I have. There were giant slabs of it in my classroom and I have an idea they are about as old as I am! Then I layered on a piece of torn muslin fabric that I had typed on, but because it was so transparent you couldn't read it with the print from the book underneath it. I ended up putting some gesso over the area and typed on a smaller piece of muslin to place on top of the gesso. 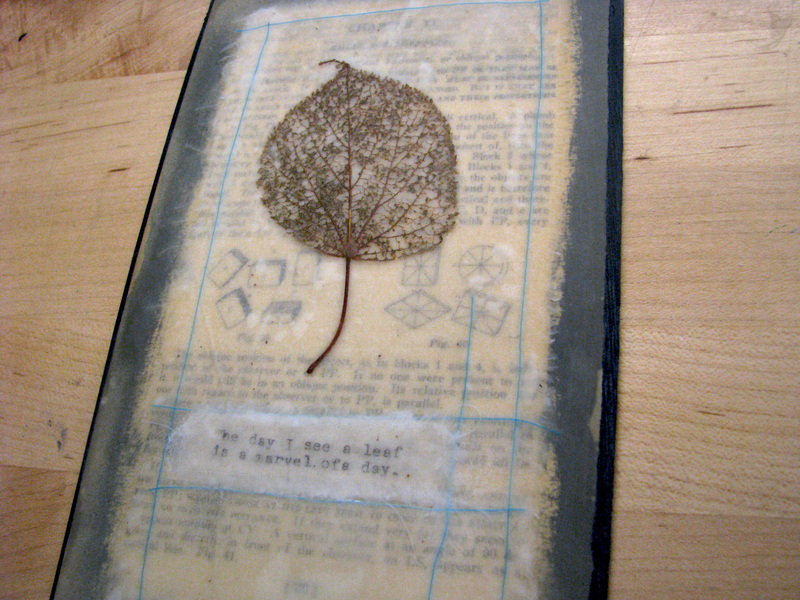 I have all sorts of pressed leaves so I chose this decayed leaf to imbed in the wax along with some blue thread. I really wanted to sew some red x's around the fabric before I layered it on but I had no red thread and I couldn't find a needle. So I was impatient and just improvised. But overall not too bad! I just can't wait to learn more at the workshop! Looks great Laura! Bring it with to the workshop, I'd love to see it in person. 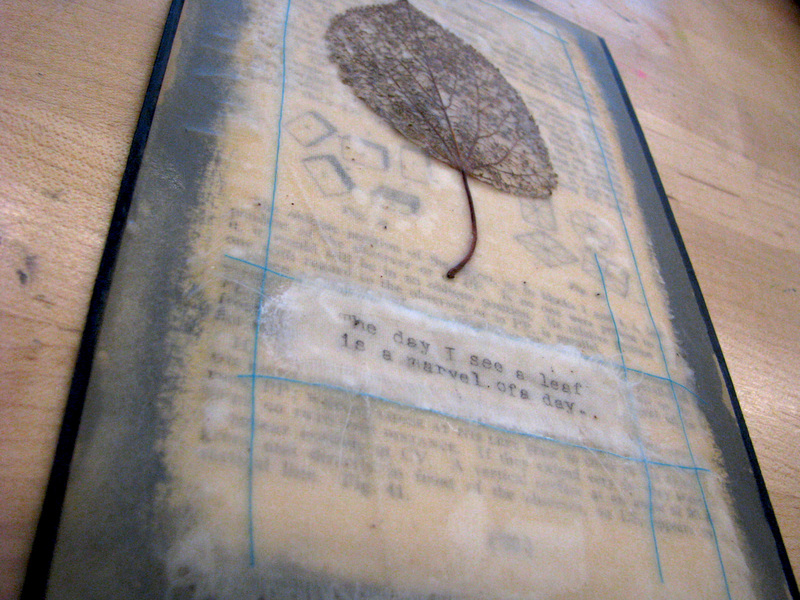 You should also bring some of your pressed leaves too! Isn't the transparency so fun to play with? It looks gorgeous! I havent worked with wax but it seems like it would be fun. Thanks for the kudos Bridgette and Veronica! beeswax is often used, maybe yours is paraffin? Wow, that is very cool...I've always been interested in art with wax but not sure of it all. Very nice. Kerri and RC you should definitely try this! All you need to start is a small crock pot and some beeswax. Oh and a heat gun definitely helps too so you can fuse the layers smoothly. And I wish I had more skeleton leaves, this was my only one! First new art of 2011!